Successfully Added Ulefone Future Smartphone - 5.5 Inch Full HD Screen, Octa Core Helio P10 CPU, 4GB RAM, Android 6.0 (Gold) to your Shopping Cart. The Future of smartphones has arrived and it looks awesome. The new Ulefone Future is touted as the first true bezel-less display, and its without a doubt one of the finest phones we've seen, and we've seen a lot. Ulefone claim the chassis is made from a single piece of titanium aluminum alloy that's been carefully crafted to bring supreme beauty and strength, ensuring the Ulefone Future is a real flagship killer smartphone. Packing in loads of features the Ulefone Future tips the scales at 190 grams but remains relatively thin at a shade under 9mm, which is no mean feat considering the phone has a fingerprint sensor, 16MP rear camera and substantial 3000mAh battery all jammed in there. With its bezel-less 5.5 inch display you can enjoy full HD 1920 x1080 resolutions and the slight curve to the screen as well as its 2.5D arc glass bring superb viewing angles. Covered by the toughened Corning Gorilla Glass 3 its tough enough to withstand scratches and abrasive knocks so they won't interfere with your viewing pleasure. Under the exquisite exterior is the Helio P10 chipset with its 1.95HGz 64 bit processing across 8 cores. When combined with the substantial 4GB of RAM the Ulefone Future's performance is nothing short of exceptional. Utilizing the latest Android 6.0 Marshmallow operating system the Ulefone Future benefits form advanced features such as Google now on tap as well as Doze mode, allowing the CPOU speed to be reduced while the screen is in standby, significantly boosting the battery life. With its 32GB of internal memory and 128GB expandable storage option you will have room for plenty of entertainment on this smartphone and can load up on all your favorite apps, games and movies. all of which will be displayed without any dropped frames thanks to that Mali T860MPS GPU. Quick Charge technology ensures that when you do need to recharge it can be done swiftly so thers very little downtime and you'll be back to full power as quick as can be. 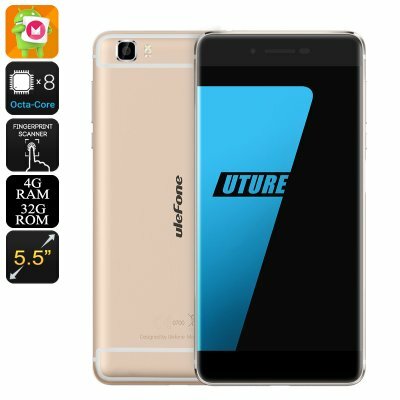 The Ulefone Future Smartphone comes with a 12 months warranty, brought to you by the leader in electronic devices as well as wholesale Chinese smartphones..